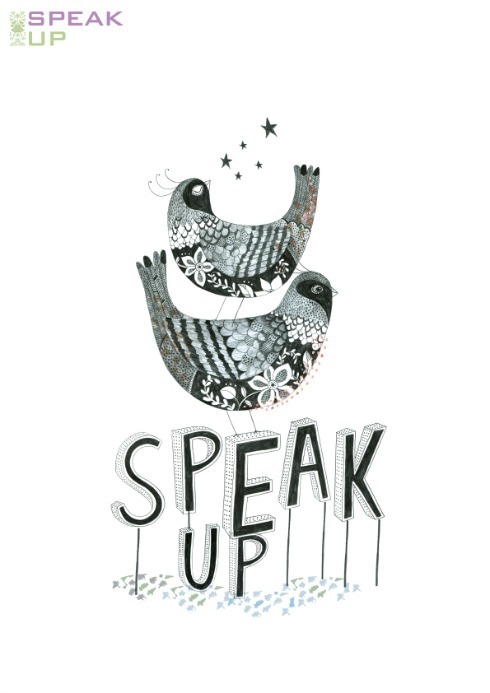 Today’s post is for those of you who have been asking me about Speak Up. If that is of no interest to you, my apologies, normal service will be resumed in the next post! Thank you so much for responding to my request for thoughts on a Speak Up day; I very much appreciate it. The power of social media is fantastic. I’m getting very enthused by your enthusiasm! Inevitably there are lots of thoughts on an appropriate venue for Speak Up and coming through loudly and predictably is London. I will be putting on a day in London but could also be persuaded to have an alternative if there is sufficient interest. I have several corporate clients in London, too, who have indicated that they’d send some of their women managers so hopefully it would be a good cross section of amazing women, with great networking opportunities as well. The absolute maximum number is 16 though; this is an ‘intimate’, supportive day where everyone gets a chance to think and reflect and be heard. No role plays though, definitely none of those. When I write my courses my aim is to send you away feeling at least an inch taller, bursting with even more confidence and ambition, and feeling very fabulous! You’ll also have had the opportunity to reflect on your career and plan your next steps. The date will probably be Monday 9th May with a venue in West London, possibly the Novotel, London West. We’re still talking and looking so if you had any thoughts on good venues please share them. The hotel has parking and is 6 minutes from Hammersmith tube. Update: this venue & date now confirmed. I am also considering the idea of having a meal together Sunday night but I don’t want to disadvantage women who cannot stay overnight. I think I’ll wait to see how many of you decide to stay over and see what you’d like to do. We’ll probably get a discounted rate but can’t say definitely as we haven’t booked it yet. I’ve been asked about fees for Speak Up and below are the costs. These costs include lunch, and refreshments on the day, plus a free web code for you to download the audio version of Speak Up as a refresher. It also comes with worksheets so you can revisit the course whenever you want. We’ll also have a dedicated web page so you can talk and share progress after the day. Plus, all delegates have the offer of 3 post course coaching sessions with me at a reduced rate for delegates (see usual costs here). Corporates: @£550 per delegate with 10% discount if sending 2 or more. Individuals/self employed and registered charities @£450 per delegate. A non refundable deposit of £100 secures your place (but if something unforeseen happens and you cannot attend you will still get access to the audio, plus I’ll include a special follow up coaching session from me, so no risk to you at all, really). It really helps with planning to know numbers in advance so, as a special inducement to book early, if you book before March 9th 2016 you’ll receive a lovely gift from me. It’s not a piece of merchandising, I promise, it’s a genuine thank you gift you can take away with you and enjoy at your leisure. There it is, I hope that’s helpful. Once finalised there’ll be an official web page but this is advance notice for regular readers.